This may seem like something rude to say about people who work for you, but at times, one is faced with the bitter fact that the person who is working for you and with you is not altogether competent/energetic/honest/hard-working/diligent or whatever. Now, I run a consulting practice and I have just one employee who sits outside my cabin and - takes calls, gives appointments, takes out print-outs of my prescriptions, coordinates the incoming/outgoing patients, collects my fees and so on. He/she is, effectively, more than one person rolled into one: receptionist, telephone operator, water server, etc. etc. etc. I should be more accomodating since I am taking the work of four or five people from one person. Right? So why is it that I am saying so many negative things about this soul? Mind you, this is a general rant, and does not refer to any specific person or persons who have, at any time, worked with me or under me. Well, the sorry fact is that some of the people who have worked with me have really, really been horrid. Either they are plain stupid (in which case, I should be called the bigger fool for having employed them! ), but some of the others are wily, lazy, pre-occupied with their own things or simply, so truant that I am paralysed without their presence. On the other hand, even when they are around, they are so incompetent or adverse to improving that they end up giving me grief and stress. How does one deal with this kind of mess? I cannot well throw them out for I need them too, to carry on with the mechanical work that forms a lot of the work that they do. I also consider the fact that I am not paying them top rupee, since most of them are students who come to work for me in their spare time, and a few are really needy people with families who it would be heartless to throw out of job. Thus, I continue to tolerate them till I can, or till they themselves realise their fault and ask to be released from the job. Starting on the eve of the 26th of November 2008, Mumbai city came face-to-face with stark terror: a group of well-organised terrorists landed at Sassoon Docks and proceeded to different places from where they masterminded attacks that left hundreds dead and many more injured; what I want to say about the actual attacks is already on my other blog in the form of three entries that are here, here and here. In this entry, I am about to share with you the metaphysical dimension of the attacks: we all saw, over the days that the attacks continued, the aggressive attitude of the terrorists and in contrast, the fear and panic on the faces of the citizens of Mumbai, many of them dying unnecessarily in the random shooting of the terrorists. At the C.S.T. railway station, Ajmal Amir Kasab and his acco mplice shot people waiting for their trains so cruelly and randomly that the victims never saw it coming. 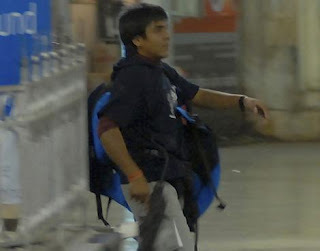 Here is a photo of the surviving terrorist Kasab. As you can see, he is a fairly handsome young man of about 22-23 years' age. Hailing from Faridkot district of Pakistan, he was one of the ten young men who devastated some of the most cherished buildings of south Mumbai. They - i.e. the terrorists - were clinical and brutal in their demeanour and in their action. Gone was even a shred of conscience as they set about killing people mercilessly - unaware that by killing even one person, they were changing or, dare I say, killing humanity as we understand it. Equipped with AK-47 machine guns, grenades, grenade and bomb launchers, satellite phones, and what not, these ten killers descended upon unsuspecting travellers on the railway station, watchmen, patients and doctors at a nearby public hospital (the Cama and Albless Hospitals), pedestrians, adults, men, women and children on the roads near Cafe Leopold and the Metro Adlabs cinema, guests, staff and security men at the Taj Mahal Palce and Tower Hotel, the Trident Hotel and the Oberoi Hotel, and finally, the residents and others at Nariman House where 6 innocent Jews were killed in cold blood. In addition to the hundreds of Indians who died, some while eating, others while just going about their way towards home, several tourists from many different countries of the world also died within the hotels that they were staying at or visiting. Staff of all the hotels died, some entire families, such as that of the General Manager at the Taj Palace - except that the father survived. At the C.S.T. railway station, entire families were killed in the gunfire, which, although it seemed random, was actually precise and targeted to cause the maximum amount of panic and psychological damage. Through it all, most Mumbaikars stayed away from the roads, for over 2-3 days, watching the "drama" unfold over television, as the armed forces and the NSG began their rescue operations. They would finally emerge victorious after nearly 2 1/2 days, but during those 60 hours, ordinary Mumbaikars lived and died a thousand times: stories of carnage intermingled with tales of heroism and supreme sacrifice as several distinguished city policemen and some NSG guards fell to the bullets of the terrorists. In addition, several less well-known policemen also died. And we, the ordinary citizens, watched wide-eyed, our hearts in our throats, tears in our eyes, and an anger that gradually welled up inside us as we prayed that the aggressors got their comeuppance and were killed. A terrifying week indeed. Heads rolled in the government - both at the state level and at the center, as chief ministers, home ministers and bureaucrats resigned. Homage was paid to the heroes of the nation and they all received state burials. And we, the common citizens, watched it all from home on the various news channels. After three to four days, people gradually started going back to work, still depressed, dizzy, worried for their safety, panicking at the slightest rumour, and above all, angry at the inefficiency of the government, the intelligence department, the bureaucracy, the politicians and the armed constabulary. But that is another story, for some other day. Most readers would be aware of how terrorists have held Mumbai hostage since 9:30 p.m. on the 26th of November ... and right up to now ... as they continue to shoot and terrorise innocent people at more than one location ...I am too shocked to write coherently for now, but suffice to say that this is the worst act of terrorism for India ... ever. Writing this on the evening of the 27th: the siege at Taj and Oberoi (Trident) hotels and at Nariman House continues. So far, over 100 people have died, including 6 foreigners and 14 policemen (which includes 3 decorated policemen - Chief of ATS Hemant Karkare, DIG of ATS Kamte and Police Inspector Vijay Salaskar). At the time of writing this, I have learnt that these are terrorists who came by boat from Porbunder in Gujarat. They have been hoarding large numbers of AK 47 machine guns and hand grenades for over 2-3 weeks inside the two hotels. When the attacks started, they created many areas of confusion by having bombs explode inside taxis in places as far off as Vile Parle, Dockyard Road, Colaba Market, Napean Sea road etc. This was then followed by attacks at the CST railway station, and then, the three locations that I have listed at the beginning of this paragraph. BETTER OR WORSE, THIS IS ME ALL RIGHT! Of the time gone by, I suppose. I grew contented to the core. As with dad, spoke man to man. And shun all I held dear. This is me, all right .